Jill and Molly Stewart are cousins camping with their families in northern California. When a massive earthquake strikes they are lucky to escape injury, but soon after, a tsunami rushes in from the ocean and the girls take refuge in a hollow in a redwood tree. 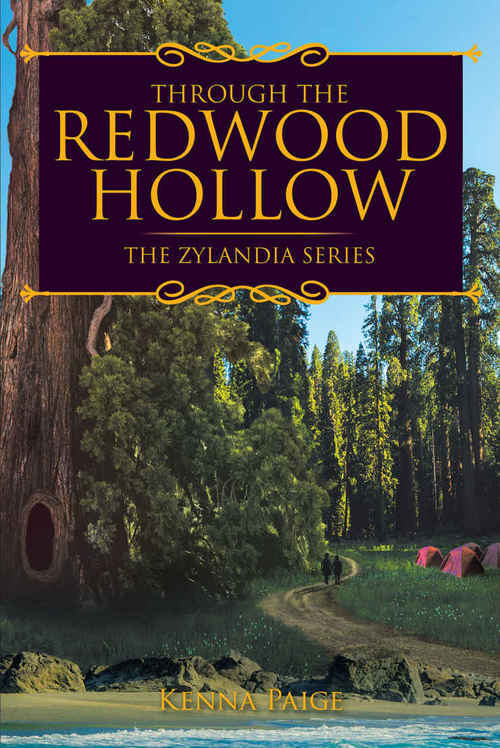 THROUGH THE REDWOOD HOLLOW they discover Zylandia, and in this new land, much is strange. As the hollow has closed up and they can't return home, Jill the elder leads her young cousin Molly to look for help. The people here don't know about ranger stations and phones. They're rather large -- giants, in fact. And not that friendly. After some desperate scrambles, the girls finally find someone smaller than they are, who might do them a favour. They are told that they need to go to the Grand Elzen, who is probably the only one who can get them home -- if anyone can. Comparisons with The Wizard of Oz abound, including the natural disaster, the quest for an important personage and the group of small comical friendly folk. Gnomes and message fairies, who don't get on with giants, agree to aid the girls. Herzdon, a fairy, has trespassed against others and needs to redeem himself before he can be freed from his outcast state, like Dorothy's helpers who were lacking in various ways. Later, the girls are passing through a mountain tunnel of gorgeous stalactites when they are surrounded by evil denizens of the caverns, like Moria in The Lord of the Rings. I did find many changes of scene, including a desert, and nerve-wracking battles. In Zylandia, Jill and Molly happen to fit a prophesy about two strange girls from another world. But they are both under twelve. How much good can they do for anyone? Even travelling is dangerous, and they just want to go home. I found that they matured a great deal from the early pages, as they had to depend on each other and take responsibility, then had to think their way through many challenges. Young readers will expand their vocabulary with this fantasy, as the writing is varied and very descriptive. Author Kenna Paige lives in the Pacific Northwest which provides her with inspiration for some of the landscapes in THROUGH THE REDWOOD HOLLOW. Can cousins Jill and Molly Stewart find a way home after falling through a redwood hollow into the magical land of Zylandia? Or will the evil magic of the nefarious necromancer keep them from ever making it back to their family? With the help of a message fairy and a couple gnomes, the girls set off to seek help from the Grand Elzen, the most powerful person in the land. Their journey is often perilous and always full of unexpected situations. After being abducted by pixies, the girls are told of an old prophesy that foretold the coming of two girls �from the Land of the Free� to save the little pixies� blind queen. Is it even possible for the ten- and seven-year-old girls and four small friends to accomplish such a task? And even more important, will risking their lives to complete the quest guarantee Molly and Jill safe passage home?